Forklift Carriage - Rated by the tine carriage lifting capability, there are actually four sizings of hook type blade carriages. The hook type fork carriages have been standardized. Class I carriages are rated for loads as much as 2000 lbs. The carriage bar spacing for Class I is 13 inches. Class II carriages are rated for loads as much as 5,550 lbs. Their carriage bar spacing is 16 inches. Class III carriages are rated for cargo as much as 10,000 lbs. The carriage bar spacing for this particular class is 20 inches. Class IV carriages are rated for loads as much as 15,500 lbs. The carriage bar spacing used for this capacity is 25 inches. The carriages for pin type blades could be different depending on the maker. Pin mounted forks could differ by the amount of offset between the blade eye and the blade. 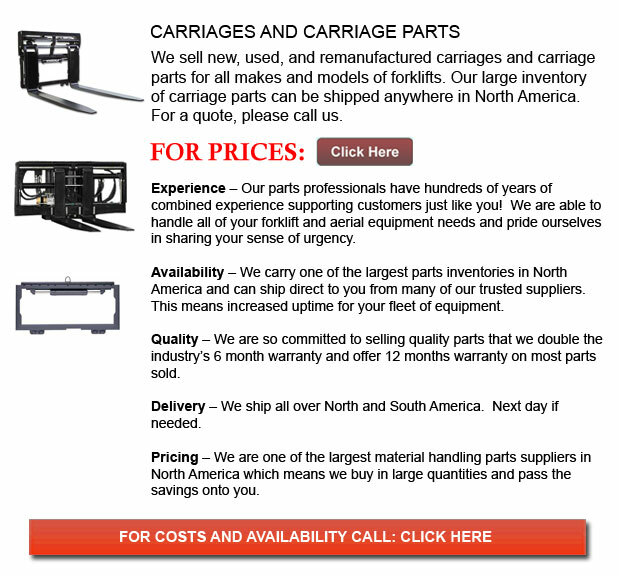 Carriage capacity will be established by the carriage pin size and by the fork size.